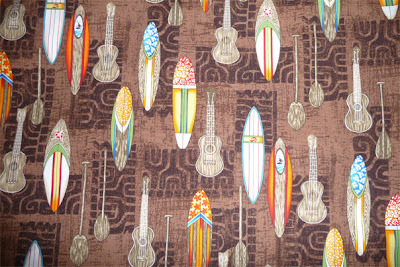 I Quilt, Therefore I Am: Fabric=Yes/Design=No - "Surfboards and Ukeleles"
I found this 100% cotton print in a fabric shop on Maui, and bought 3 yards. To give you and idea of scale the surfboards are about 3 inches long (top to bottom). Originally, the fabric was intended to be made into a luau shirt for my husband. But he bought a couple of shirts while we were on the islands, so perhaps this should just become a quilt.